Hip-hop group, 2NE1, is set to take on their 2nd World Tour this year. Since their New Evolution World Tour back in 2012, the group has drastically evolved to show more varied sides. Their latest releases and beloved singles, ‘Falling in Love‘, ‘Do You Love Me‘ and ‘Missing You‘ showcases 2NE1’s femininity and vulnerability amidst their boldness and adds to the group’s unique color. Up to date, 2NE1 has released a diverse genre of hits ranging from Hip-hop to Reggae, Teuroteu (Trot) and Ballad, proving the group’s versatility in the Korean music scene. With 2NE1’s All Or Nothing World Tour 2014, 2NE1 will be performing previous hit-singles and new songs from their highly anticipated new album, ‘All Or Nothing‘. This coming tour will see the integration of the charismatic girl-group’s existing well-known hits and their new album, making the show an event not to be missed! 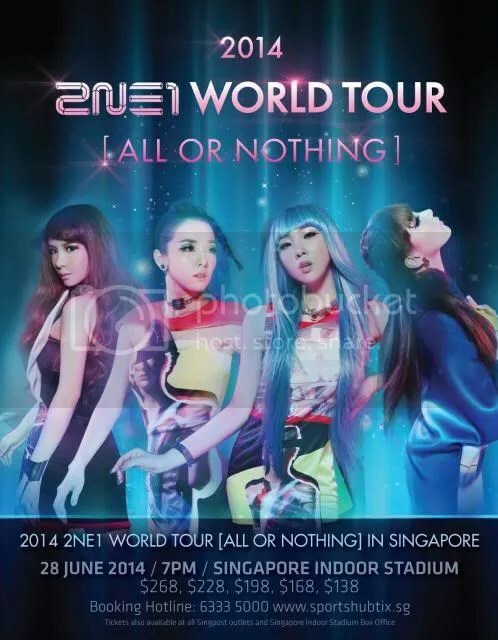 2NE1’s All Or Nothing World Tour 2014 will be held on June 28, 7PM at the Singapore Indoor Stadium. Tickets are priced from $138 and will go on sale this Saturday, April 26, 10AM. Fans can purchase tickets to the show from Sports Hub Tix at their website (www.sportshubtix.sg) or through their booking hotline (+65 6333 5000). Tickets will also be available at all Singpost outlets and Singapore Indoor Stadium box office.